New to Kroger?? Check out our Kroger 101 tutorial that will help you learn the ropes of shopping at Kroger. 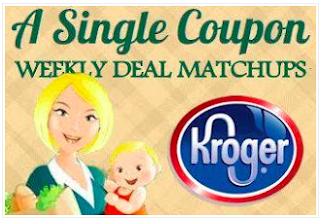 Don't forget to load your Kroger Digital e-coupons and Savingstar offers to your shopper's card before you shop! To Read the Corporate coupon policy online, go HERE and read it. Also, Check out the UPDATED list of Catalinas for Kroger. Load your 5x use Digital coupons for this weeks sale and use each one up to 5 times in a single transaction!! Pork, Chops, center cut - $3.49/lb. USDA boneles chuck roast - $3.99/lb. Kroger ground beef - $2.49/lb. Extra lean ground beef - $4.99/lb. Peaches, Yellow, per lb: $.88¢/lb. Grapes, Green, Red, or Black, Seedless, per lb: $1.48/lb. Final Price: $1.50 before Savingstar or Upromise deposit! Final Price: as low as .75¢ after mobisave rebate!